The Korean smartphone maker has finally raised the curtains unveiling the Samsung Galaxy S7 and the Samsung Galaxy S7 Edge. Both the devices were launched at the Mobile World Congress currently held in Barcelona.The phones are successors to the Galaxy S6 and the Galaxy S6 Edge and come with lots of changes. There has been a whole lot of leaks before the actual launch of the device just hinting how many eyeballs are waiting for these smartphones. For starters, the Samsung Galaxy S7 is a 5.1 inch AMOLED display while the S7 Edge is a little bigger measuring at 5.5 inches. Both the phones have the same QuadHD resolution, which is now the norm for flagship devices. Just like the newly launched LG G5, these phones also have an Always-On display. Not much has changed in terms of design as it still has a hint of the Galaxy S6, the device it replaces. The devices are launched with Samsung’s homegrown Exynos 8890 chipset, which is an Octa-Core processor along with 4GB of RAM on board. Both the phones have a 12-megapixel camera at the back along with Laser-Auto Focus, LED Flash and a heart rate sensor at the back. The phone can do 4K video at 30FPS, Full HD video recording as well as Slo-Mo video capture. The phone has a 5-megapixel sensor on the front and can record video in 1080p. The device has a revamped TouchWIZ UI running on top on Android Marshmallow. Both the phones are available in 32GB and 64GB variants with MicroSD card support up to 200GB. The phones may have a Dual SIM variant that will be available in some countries on launch. Samsung has gone back in time to get the water resistant capabilities of the Samsung Galaxy S5 on board as both the S7 and the S7 Edge manage an IP68 rating. Both the devices still sport a MicroUSB connector sticking at the bottom of the device and not the new Type-C connector that other companies have adopted. Both the devices also feature new liquid cooling technology to keep the devices cool. The Galaxy S7 has a 3000mAh non-removable battery and the S7 Edge gets a bigger 3600mAh battery. 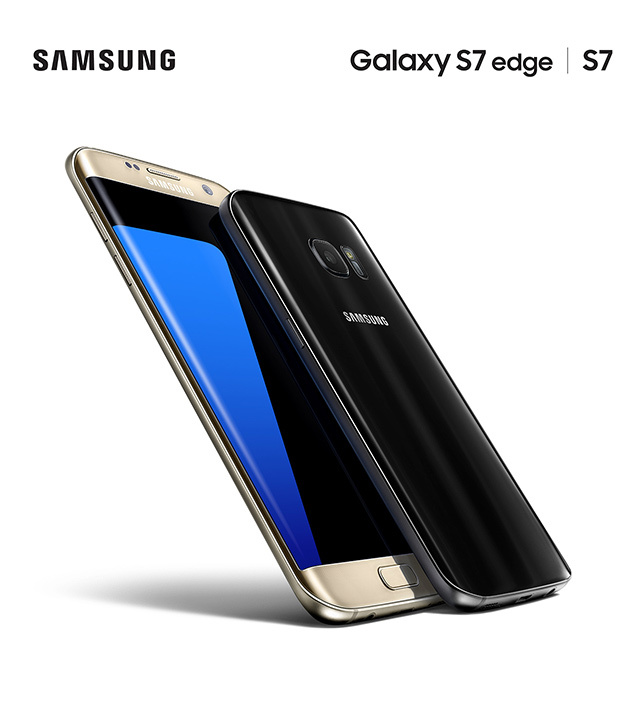 The Samsung Galaxy S7 and the S7 Edge will be available starting mid-March 2016.